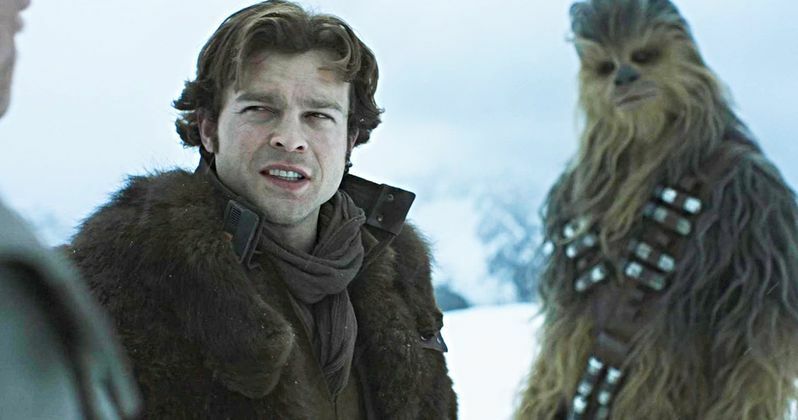 When it comes to Solo, there aren't just deleted scenes. There's a whole deleted movie. And it's locked away in a Disney vault far underground next to Walt's still frozen corpse. It will never be exhumed to see the light of day. But when Ron Howard came into take over for fired directors Chris Miller and Phil Lord, he still ended up shooting some scenes that weren't used in the movie. Guess what? We'll get to see those. And one of the most notorious cut scenes is shown off in the new Blu-ray trailer that arrived from Disney and Lucasfilm this morning. As soon as word about this scene got out, fans groaned loudly in unison. The moment on question has Han Solo, Chewbacca and Beckett lobbing snowballs at each other. Now that we get to see part of this deleted scene in action, it doesn't look that bad, and appears to fit the tone of the movie. Here, we see Han hit Chewbacca with a snowball. Alden Ehrenreich explains how this all came about. "We had to get the light right all day, so it was kind of this funny experience of waiting around and just hanging out on top of this beautiful mountain. And Woody, being Woody, started throwing snowballs at people, and so we ended up having quite a big snowball fight." So it was all Woody's fault. There are a number of Ron Howard shot deleted scenes that are making their way onto the Blu-ray when it arrives in theaters this September. They include a new scene set inside Proxima's Den. A Corellian Foot Chase. The scenes of Han Solo as an Imperial Cadet that will presumably resurrect Tag and Bink from the cutting room floor. We also get an extended look at the Battle of Mimban and an extended look at the Han Versus Chewbacca fight scene. Dryden Voss gets a couple extended scenes. There's a Coaxium double-cross and the aforementioned snowball fight. There are plenty of special features included on the incoming Blu-ray and DVD. They are mostly featurettes that explore various aspects of the filmmaking process. There is no mention of Chris Miller and Phil Lord, and the home release doesn't look to be touching on that aspect at all. Sadly, there is no audio commentary from Ron Howard, which would have sold quite a few extra copies. You can check out the Blu-ray trailer here thanks to StarWars.com.